I started writing this on Monday but I’ve been too knackered after the weekend to post about it earlier! 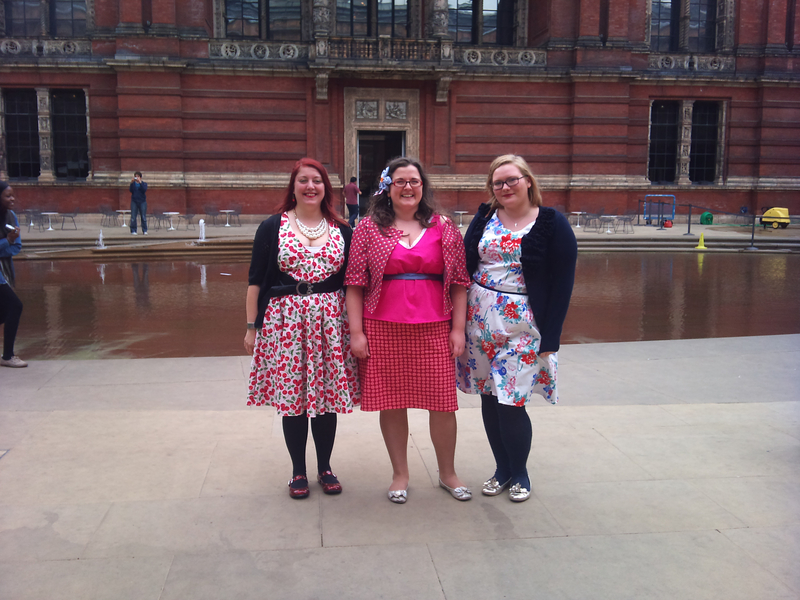 On Saturday I and thirteen other sewers headed to the V&A museum in London to meet up, see an exhibition, chat and do a little fabric shopping shopping at Goldhawk road 🙂 It was a fab day but also an exhausting one. 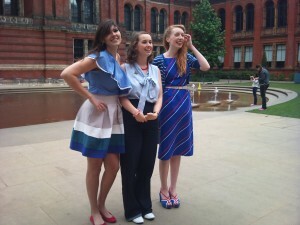 We’d all agreed to make outfits specially for the occasion and I didn’t finish mine until past 1am Saturday morning! 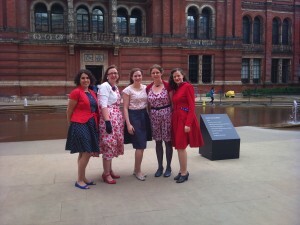 I made Burda 7556, a sleeveless dress with a full skirt in this cherry print fabric from eBay. I’m a big fan of cherry print. After my late night night, I was up around 6am in order to catch my 7.55 train to London. Magpie Mimi got on the train at the next stop and we got to the V&A for 11.20am. 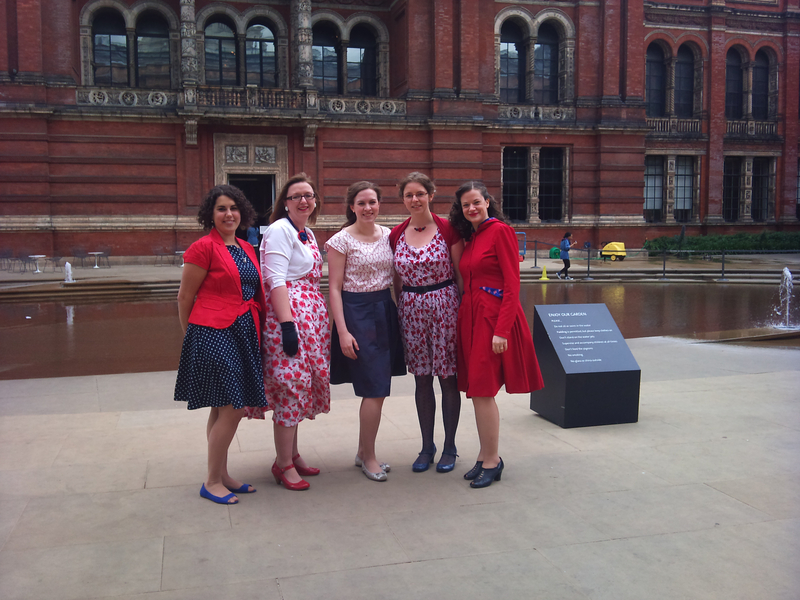 Before looking around the exhibition we all had photos taken in front of the fountain at the museum. First as one big group and then in groups of similar height! I wore a cardigan to hide my dodgy zip, more on that later, but I’m not sure I should have kept it on for the photos since it and my belt appear to have become one in the pix! I need to add everyone’s name in here! So many gorgeous dresses! And all hand made too. After the exhibition we headed over to a pub on the Goldhawk road for a pattern swap. I completely forgot to bring any patterns with me. Despite that, it had been very generously agreed that there were enough patterns or everyone to take part in the swap, even if they hadn’t brought any themselves. We had to dash to get back to Paddington so I didn’t get to spend a lot of time fabric shopping. But it’s funny, it’s not that I wasn’t in the mood to buy fabric but I had the same feeling that I get when I shop for yarn. I’m aware that I have so much already so I only want to buy something if I absolutely have to have it. 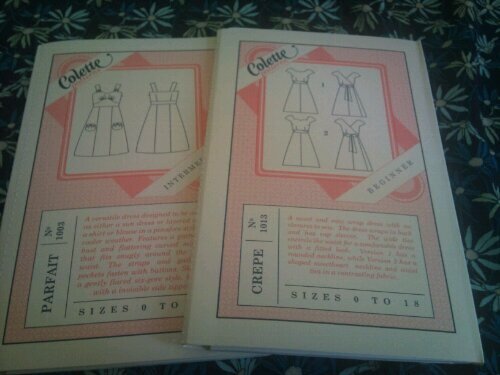 So I was a very reserved shopper and, even in that fabric mecca, I only made two purchases. Two meters of a silky teal fabric and and half a meter of bright fuchsia knit fabric. The knit is destined to become a shrug. There’s more than enough to make two shrugs. Overall, it was an amazing day and it was fabulous to meet other sewers. 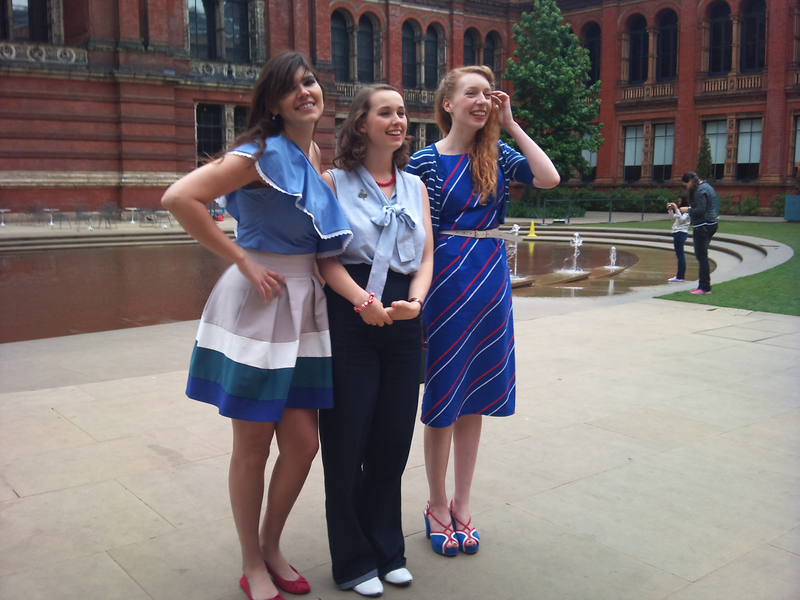 I couldn’t stop admiring all the amazing dresses that they’d made. It was really incredible. 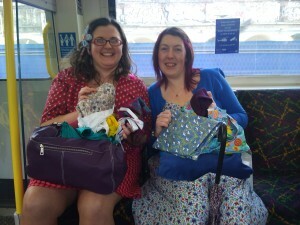 Oh, and here’s Mimi (left) and Kirsty (right) examining their purchases on the tube afterwards. It’s been a long time since I’ve worn sewn clothing that I’ve made myself since I normally knit it. It was also such a big deal to not only actually finish a sewing project but to have it, mostly, fit as well. 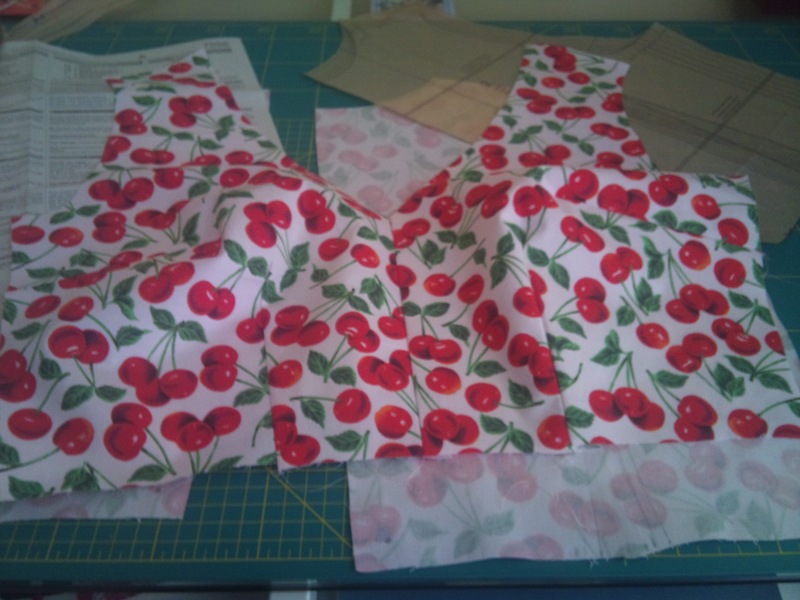 I had some scares that the bodice wouldn’t fit once I’d sewn in the zip. As a result the zip ending being a visible zip rather than an invisible one. The dress hasn’t had a happy ending ending though. There are several fitting issues. Most notably there’s too much fabric in the back of the bodice, I also need to shorten the bodice so that so that the bust line is actually over my bust – it’s too high at the moment. Plus I need to take fabric out at the shoulders of the bodice, re-sew the zip. I also need to finish the hem of the skirt – I only overcast it because I didn’t have time to finish it properly. Basically I need to take the dress apart again and redo a lot of it. But at least after that it will fit and I’ll be more likely to want to wear it again. New shoes! 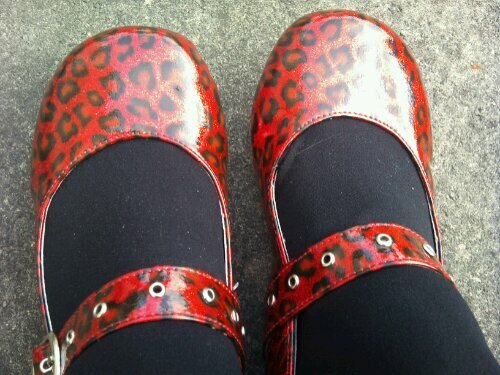 Red glitter leopard print ones! 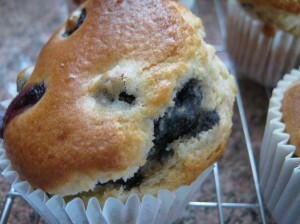 I’ve been neglecting the blog, again, there’s a surprise! I’ve had four days off this week which has been great. I needed them so much. 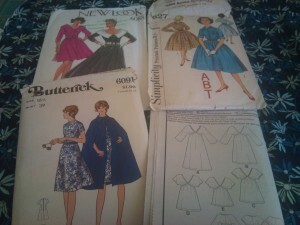 Plus I’ve been focusing on sewing and have made one and a half dresses so far. It’s not quite the target of four dresses that I’d set myself but then that was a little ambitious. My main reason for spending most of my time sewing is to make my dress for the Sew Weekly UK Meet Up this Saturday. As I wrote in my last post, I’ve been fretting and stressing about this dress which defeats the whole object of the project! Tuesday night I cut out the Burda pattern I’m using and then yesterday I cut out the fabric. 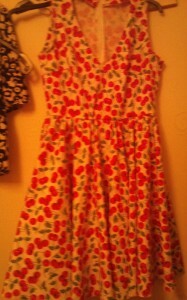 I sewed the lovely, full skirt first. I find sewing the skirt is a great way to start off a project because it’s usually fairly simple and gives you the boost of knowing that you’ve already completed half your project! Things went a bit slow after that because I realised that I’d forgotten to make dinner. 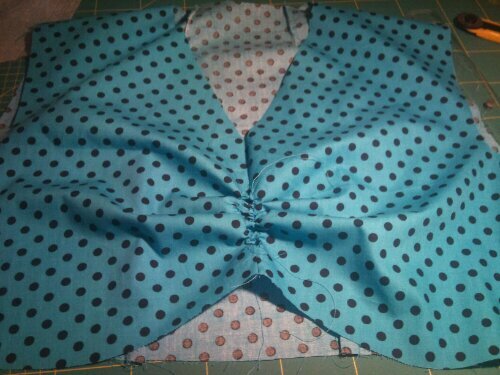 I ended up sewing bodice darts until 1.30am. Things have been a bit slow again today, not surprising really after a late night, but I’ve sewn the front bodice and have one final dart in the back bodice. Now, to finish the rest!